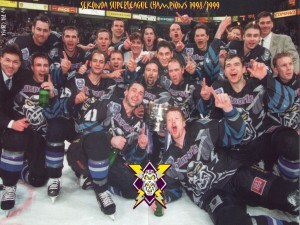 October 2002 Remembered Part 2: The Rise and Fall of the Manchester Storm. In October 2002 Manchester was revealing in sporting achievement. It had just hosted the Commonwealth Games and the city was booming and regenerating everywhere. However there were dark clouds over ice sports in the city that had been gathering for some time. Whilst the sale of the arena to SMG Entertainment and the sale of the Manchester Storm to Salford businessman Gary Cowan may have been the primary cause as the team could no longer be ran at a loss they were many back ground issues that led to the Manchester Storm not returning from Belfast at the end of October 2002. Even though Manchester has a long history in ice hockey dating back to 1910 and the Cheetham Hill Ice Palace big time ice hockey had only arrived in Manchester in 1995. The opening of the arena, professional ice hockey and disposable income for an entertainment package had given Manchester ice hockey the wow factor. Thousands turned up and the lower bowl was a sell out every night. The foyer at the arena would be packed to the rafters with queues of people. 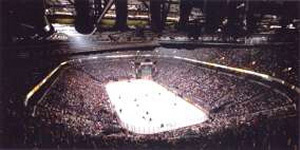 By 1997 17,245 people officially turned up to watch the Manchester Storm take on the Sheffield Steelers. However thousands more watched on the TV screens on the concourse and more still turned around halfway across the Pennines. It is still the third largest attendance for an ice hockey game in the UK beaten only by the LA Kings â€“ Anaheim Ducks NHL match ups. Despite this success the crowds began to dwindle. As the Superleague lost the likes of Cardiff and Newcastle the Storm rapidly lost supporters. There are a variety of reasons why though and not all aimed at the Superleague, UK Ice Hockey or the owners. There was a lack of investment in the youth programmes that pushed out British players of ever having a chance to play in the Superleague, there were high costs associated with playing in a building the size of the Manchester Arena and no steps were ever brought in to curb spending across the league. At the same time cultural factors played a role as more traditional British sports began to improve. Local football teams in the Manchester Stormâ€™s catchment area began to gain investment in stadia and the team, which saw them rise up the league system. Bolton Wonderers for example went from playing at the run down Burndon Park to the new Reebok stadium and became a successful Premier League team even qualifying for European games. Wigan Athletic also went from playing in the hard to find Springfield Park to the 25,000 capacity JJB Stadium and rose from the fourth tier to the Premier League. There are similar stories at other clubs in the late 1990â€™s and early 2000â€™s such as Stockport County and Macclesfield Town. There was also the rise of Manchester City that began at that time. City had fallen to the 3rdtier but playoff wins and promotions saw them return to the Premier League. Rugby Union too grew in popularity and ushered in a new professional era with local side Sale Sharks. All of which took interest, fans and money away from the novelty of ice hockey and back to the terraces. There was also the local government in Manchester at the time. The town of Altrincham to the south of the city had hosted an ice rink and a hockey team since the 1960â€™s. In fact the Manchester Stormâ€™s original owners bought the Trafford Metros license in 1995. But by the 1990â€™s the rink was showing its age. Despite campaigns and promises by Trafford Council and Manchester Council a new rink was not fourth coming and eventually the rink closed in March 2003. There is no doubt the bad experiences sounding the attempts to build a new rink and the uncertainty over the future of the ice rink played its role in deterring fans from watching the Storm. Whilst Gary Cowan insists that he withdrew the Manchester Storm from the league in 2002 on moral reasons. Stating that the rent on the Arena was not as agreed it is obvious that financially any agreement would have been hard to meet. After all hockey in the UK, then as now, is about getting bums on seats. The more fans you get into your arena the better the finical situation you can put your team in. And to get that point in a 17, 000 seat arena you need an awful lot of people in your arena and as we have seen there are a lot of reasons why there werenâ€™t enough in Manchester. In part 3 Blueliner Hockey looks at the Scottish Eagles and the reasons for their demise and withdrawal from the Superleague just a week after the Manchester Storm.